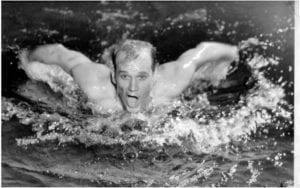 No single person has had more of an impact on the sport of competitive swimming than James E. “Doc” Counsilman, Ph.D. Not only did he create world champion athletes through his innovative teaching ideas, research and application, he made discoveries that have led to safety and design innovations benefiting anyone who’s ever enjoyed a swimming pool. In 1970, Doc Counsilman and Joe Hunsaker, a former swimmer coached by Doc, created Counsilman-Hunsaker. The goal was to provide a source of expertise for owners, architects and engineers planning and designing swim facilities, indoor and outdoor. With Counsilman’s inspiration and Hunsaker’s perseverance, the consulting firm has grown to become a world leading influence in the creation of aquatic centers, from leisure pools and water parks to world class venues for international competition. In January of 2004, Doc Counsilman died at the age of 83. He had retired from the firm in 1995, passing the torch on to his colleague and friend, Joe Hunsaker. Even now, his spirit permeates the esprit de corps of Counsilman-Hunsaker in it’s four offices and on projects across the nation. He taught us lessons in setting high goals, perseverance, integrity and common sense. Since its beginning, the firm has combined innovative design with ongoing research which has included new products introduced to the industry as well as a pure study of the forces that influence speed in the water. Combined with the curiosity about what has gone before, an ongoing re-evaluation of existing facilities, products, systems, procedures, techniques and methods have provided the basis of meaningful recommendations.